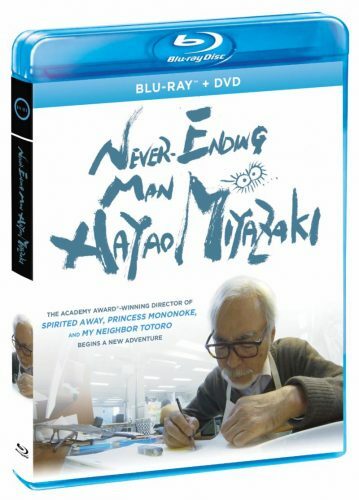 Los Angeles, CA – The documentary feature Never-Ending Man: Hayao Miyazaki will be released on Blu-ray + DVD combo pack on April 30, 2019 from GKIDS and Shout! Factory. The film offers a new look at the rarely-interviewed filmmaker as he faces the challenges of working with unfamiliar CGI technology to create a new short film. Never-Ending Man will make its home video debut following a limited theatrical release this December. GKIDS is a producer and distributor of award-winning feature animation for both adult and family audiences. Since 2010, the company has scored an astounding ten Best Animated Feature Oscar nominations with The Secret of Kells in 2010, A Cat in Paris and Chico & Rita in 2012, Ernest & Celestine in 2014, The Tale of The Princess Kaguya and Song of the Sea in 2015, Boy and the World and When Marnie Was There in 2016, My Life as a Zucchini in 2017, and most recently, The Breadwinner in 2018. GKIDS also handles North American distribution for the famed Studio Ghibli library of films, one of the world’s most coveted animation collections with titles Spirited Away, My Neighbor Totoro, Princess Mononoke and others. GKIDS recently launched ANIMATION IS FILM, an annual LA-based film festival. The second edition took place October 19-21 at the TCL Chinese Theater in Hollywood. ANIMATION IS FILM embraces the highest aspirations of animation as a cinematic art form and is a vocal advocate for filmmakers who push the boundaries of their work to the fullest range of expression that the medium is capable of.